Celebrating 20 years of performing, promoting, recording and curating new music, Halcyon’s last program for 2018, Shining Shores, collects together pieces inspired by the natural elements of water and moonlight. Taking time to reflect on the world around us, we wander beside the flowing Seine in Rosalind Page’s Apollinairesongs, are transfixed by the minute life in rockpools or towering mountains reflected across the bay in Gordon Kerry’s Three Malouf Songs and walk in the wet sand beside the seashore, following the lark’s song or a boat adrift on the tide, in Gillian Whitehead’s Girl with a Guitar. The night sky appears - ‘the sleepy stretch and dazzle of it’ ablaze with stars ‘like bees’ - and the changing moon is ‘like an apricot’, ‘honeyed’ or ‘silvering shores’. In our 20th anniversary year, this program again features composers of outstanding vocal music with a deep responsivenes for the poetry that inspires them, many of whom have had long associations with Halcyon. Works have been drawn from Australia (Rosalind Page, Gordon Kerry, Sadie Harrison, Ross Edwards), New Zealand (Gillian Whitehead) and the UK and USA (Hilary Tann and Robert Lombardo) and the program sees the return of a two signifcant and quintessentially Halcyon works, Rosalind Page’s Apollinairesongs (2002) and Gordon Kerry’s Three Malouf Songs (2016). As Halcyon celebrates 20 years of exceptional music-making, come and join us for a midwinter evening of intriguing and eclectic new chamber music. The program features Australian premieres by mid-career composers Japanese-born Dai Fujikura and Belgian Annelies Van Parys alongside a couple of songs from our Kingfisher project and a brand new work by Elliott Gyger, celebrating his 50th birthday this year. “From the hungry waiting country (2006) weaves together fifteen texts – seven in English, eight in ancient languages – each sung by a different soloist or subset from its female vocal quartet; at times two or three texts are superimposed, working in independent tempi. Petit Testament (2008), by contrast, comes as close as possible to multitracking a single voice in live performance; Jenny and Alison are called upon to play vocal hide-and-seek with one another, merging into a single line featuring unison, heterophony and interior dialogue." This year as the ensemble and composer both celebrate significant milestones, it seemed the perfect time to join forces again. "This kind of life (2018) is written once again for Alison and Jenny’s voices, but rather than blending and blurring they are kept quite distinct, as they sing the words of two people in dialogue with one another. Each is supported by her own miniature ensemble of two instruments (clarinet and piano with the soprano; cello and harp with the mezzo), although as the work progresses these ensembles begin to overlap and fuse. A musical celebration of friendship, This kind of life seems an apt choice for a program highlighting the rich network of collaborations that has developed across Halcyon’s 20-year history – a network which I am grateful and proud to be part of. 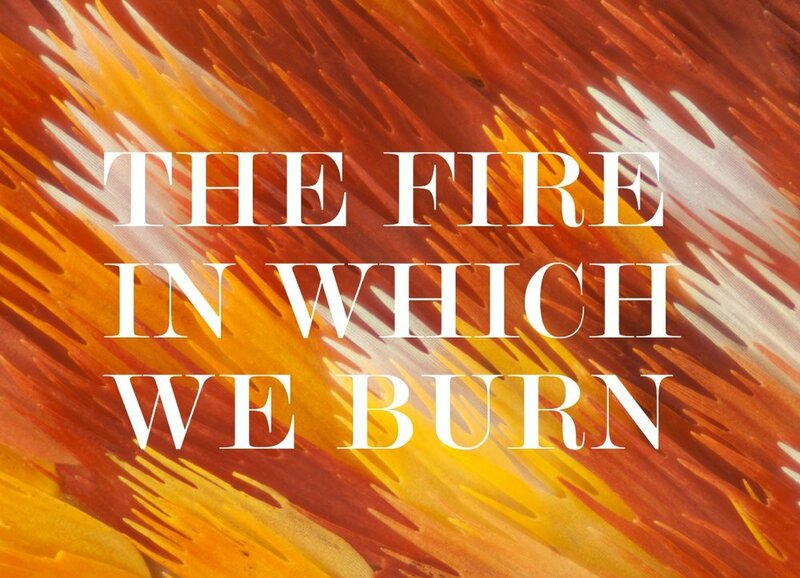 The fire in which we burn is an all-Australasian program featuring works by Ross Edwards, Sadie Harrison, Tim Dargaville and Gillian Whitehead with texts that span two centuries, seven countries, and the complete cycle of seasons. By reflecting on the cycles by which we live, we gain a glimpse of the turning wheels of history seeing ourselves mirrored in the shifting backdrop of the natural world. Sadie Harrison’s With what does winter’s summer’s sing takes us on a journey through the seasonal patterns of nature and love, interspersing them with a series of exaltant ‘calling' songs, reminding us of those moments of joy in the midst of the passing of time. An Australian composer who has been resident in the UK for many years, her song cycle speaks of how the passing of time resonates with our own cycles of love and loss. This has been a common poetic conceit for centuries, with Spring heralding new love and Winter marking the coldness of a dying relationship, or a life which is at an end. Her texts draw on both ancient and modern literature in English translation, creating a fresh vernacular for words that span centuries. Ross Edward’s Five Senses is inspired by the poetry of Judith Wright, renowned not only as a poet but as an environmental activist. Every poem’s images are so clearly drawn - from the fiery wheel of creation, the ageless columns of dark foreboding rainforest or the delicate dew-encrusted spider webs, right down to the individual flowers on the forest floor. At times ominous and mysterious or exuberantly joyful, it is a celebration of the Australian landscape and the capacity it has to touch us and inhabit our senses. Gillian Whitehead’s Because of the child, a short unaccompanied song, was composed for a group of people keen to raise awareness of environmental issues and draws our attention to the role man plays in his environment. She spends time between both Australia and New Zealand, and the many natural and cultural references in her life are clearly present in her prodigious body of work. Tim Dargaville’s Kolam, movement III for solo piano is inspired by the ancient art of Kolam, an art of symmetry, precision, and complexity, where circular patterns of geometric lines are created on the ground using curved lines and dots and drawn with powder made from rice and other natural materials. Often drawn by women at the threshold to the house, throughout the day the drawings get walked on, washed out in the rain, or blown around in the wind only to be re-made the following day. This intricate art reflects both the movement and constant nature of time, but also the renewal it will always bring. Halcyon begins the year with an intimate program featuring the sonorous and captivating combination of voice and cello. In Of Earth and Stars long-time collaborators Jenny Duck-Chong and Geoffrey Gartner present a program of duos and solos spanning four decades and three continents. You will be introduced to gems by Julian Yu, Moya Henderson, Martin Wesley-Smith, Sadie Harrison, Brad Taylor-Newling, Simon Holt and Michael Berkeley, and to celebrate Alberto Ginastera's centenary year there will be a special performance of the composer's tour-de-force for solo cello, Puneña No. 2. Inspired by a deep love for the Australian natural environment, the music of Ross Edwards radiates both joyous exuberance and meditative reflection. A Rhythm that Dances celebrates these twin aspects of his writing. Showcasing works spanning almost 40 years, this retrospective program focuses on Edwards’ music in miniature and features solo performances by some of Australia’s leading contemporary musicians. The concert is also a rare opportunity to hear his two major song cycles, The Hermit of Green Light (1979) and Five Senses (2013), as well as Maninya I for voice and cello, which is an early example of his celebrated ‘dance-chant’ style and an inspiration for his violin concerto, Maninyas. Also on the program is his Piano Sonata(2011), commissioned by the Conservatorium for Bernadette Harvey, who recently gave the US premiere.